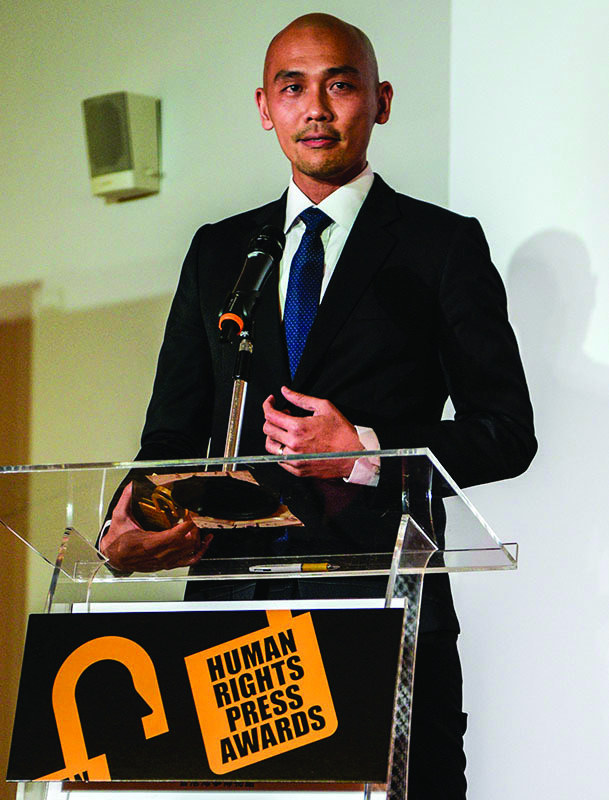 The Human Rights Press Awards celebrated its 20th birthday at the Maritime Museum on May 6, with a standing-room-only crowd of 170 participants, supporters and guests. For the first time, grand-prize winners were given the chance to speak to the audience directly about their experiences. Several flew in from overseas to do so. Esther Htusan, who recently became the first Burmese to win a Pulitzer Prize, caught a 1:30 a.m. flight from Yangon early that day to make the event on Friday night – after securing a last-minute visa from the Chinese Embassy. After a much-needed cappuccino at the FCC, she went on to the Maritime Museum to make a heartfelt speech about how the Associated Press’s coverage of abuses in the seafood industry resulted in the freeing of 2,000 modern-day slaves. Her work – created with three other women from AP – won the HRPA’s grand prize in English-language news coverage. “For many, many years, it was an open secret to many people – but nobody ever interviewed the slaves on Ambon in East Indonesia,” Htusan said. “We finished up interviewing hundreds of slaves; and followed the cargo ships that sent the seafood to supermarkets and dinner tables. “Right after we reported our stories, more than 2,000 slaves were freed – many from my own country, Myanmar, and some from Cambodia and Laos. Al Jazeera’s Chan Tau Chou, who won the grand prize in English-language broadcasting with “The Invisible Children of Sabah, Malaysia”, dedicated his prize to the world’s stateless people. “It’s a big encouragement to the team who worked very hard on a day-to-day basis to tell these stories,” Chan said. “In this day of relentless news feeds, where attention spans are diverted by the latest cat video, we are very thankful for this very important stage to once again raise attention and highlight the issues in our film”. “The sad fact is that many of these issues have been around for decades. The problems faced by stateless people – the lack of equal rights, basic rights, like health care and education – have become more aggravated over the past five to 10 years. “Now a generation of their children are growing up facing even more aggravated problems; they are even more vulnerable. Acclaimed photographer Sim Chi Yin could not make it from Beijing to attend the HRPA ceremony in Hong Kong. However, speaking by video, she explained how she spent four years investigating the deadly lung diseases caused by China’s gold mining industry. “Dying to Breathe” won the grand prize in photography. She wanted to honor Mr He, the main character in her photojournalism series, who has since died of his work-related illness. The event also allowed the HRPA’s founders to have their first official reunion in two decades. Robyn Kilpatrick, who was Amnesty International Hong Kong’s chairperson in the mid-90s, flew in from Australia to speak about the importance of keeping projects like the HRPA alive. She was joined by co-founder Francis Moriarty and Angela Lee, a HRPA photo judge who was been with the organisation from the very beginning. “Hong Kong press, despite working under sometimes quite difficult situations… should be proud of the work,” Kilpatrick said. The HRPA could not survive without financial support, and so flowers and a special trophy designed by Henry Steiner – who also designed HRPA’s logo – were given to Anne Marden, who has donated to the Awards since their very first year in 1996. 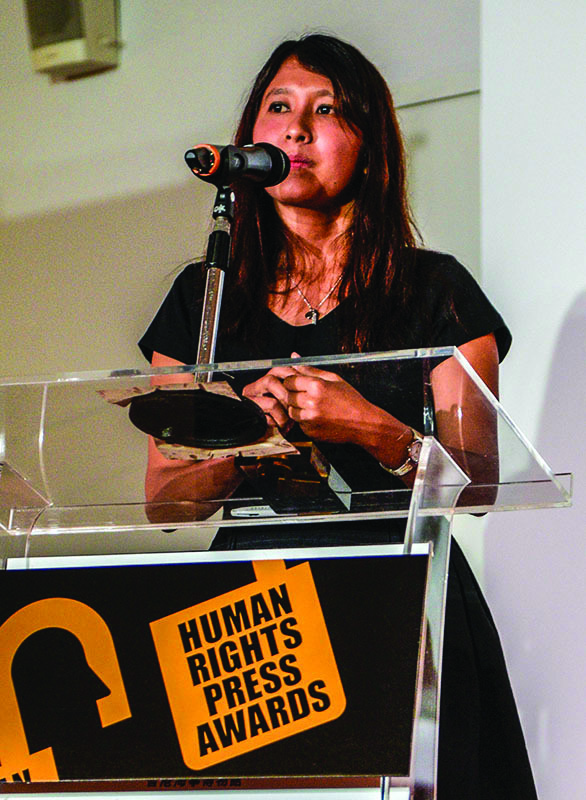 For full winners list and more information, go to HumanRightsPressAwards.org.